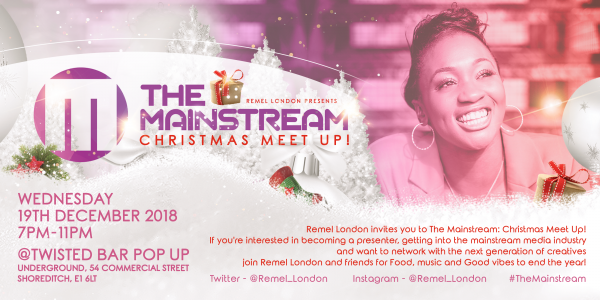 Remel London Presents… The Mainstream: Christmas Meet Up! Remel started The Mainstream in 2017 as an opportunity for up and coming presenters to meet, network and take part in an exclusive Q&A with an established TV and Radio Broadcaster. A year later and an inbox full of questions, with requests for advice and shadowing opportunities, Remel has decided to share her own experiences over drinks, food and music with you all! If you’re interested in becoming a presenter, getting into the mainstream media industry and want to network with the next generation of creatives join Remel London and friends!